Another one I’ve really been wanting to post here. Thanks for your comments and until next post, enjoy your stay. Lately feeling going more deep into the 90s. Just kidding, hahaha. This time JAST stepped in with this one as a publisher, while being developed by Tiare. Enjoy and comment, thanks for visiting NemuVN project, as always. If you were looking for something new, for me the old is the new new, too. Until next post, if I ever stop organising files everyday. So can’t complain, isn’t it? First game to get posted here… After a loong wait. As you already know this company, Studio e·go! 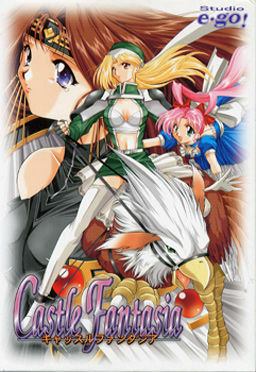 is somehow known for making this series of RPGs called Castle Fantasia in its country of Origin, and on top of that, we got an english patch released from the 2nd game of this series some years ago. Images of packaging and contents from original game will be posted in an album later, checking where could be best to store them. Thanks for your comments and also welcome again to NemuVN, a project that I hope it will be around for some time while I can. PS: Currently not accepting any request, but sure you can make any requests where I usually go by from time to time. Hope to get more stuff organised and… Stay tuned.